The only economic report released this morning was the Producer Price Index, which showed a down-tick in November. However, the core version of the index showed an uptick. Either way, they were in-line with expectations and left little reason to react. As quiet as this week was from a news regard, next week will be the opposite. Along with key housing and inflation data, we'll be forced to endure Wednesday's Fed meeting, subsequent monetary policy decision and commentary. The taper debate lives on, and so will the volatility. In our view, the Fed will continue to pledge the existing free money monetary policy for the foreseeable future. Which, should offer support to asset prices. In a previous newsletter we mentioned that the Treasury complex had a tendency to find a near-term low after an auction cycle. Particularly, one in which the 30-year bond is involved. After all, the market has to digest the new supply before reverting back to a more equilibrium price and turning back to fundamentals. With yesterday's 30-year bond reopening behind us, we can't help but feel like the path of least resistance is higher. It seems as though fear of a Fed taper hit the market a few days early. In recent previous occasions the pre-Fed dip has been bought into by aggressive traders looking to get long ahead of the Fed. Bernanke and Co. have worked hard to keep their interest rate scheme in tact, and will be very careful not to provoke a repeat of the summer Treasury plummet. They had the exit door swung wide open for them in June and they opted to close it. With that in mind, we believe they are expecting the QE experiment to continue at full-force well into the new year. **Consensus:** We think the lows are in, or near. We prefer being bulls on the dip. The bears are salivating over the recent dip in the ES (S&P futures), and we don't blame them. Any type of correction at all has felt like a pipe dream most of 2013. However, we aren't convinced that this particular pull back will be "the one" (for reasons detailed in section below) which most agree must come at some point. Strictly from a charting point of view, the inability of the ES to break below the 1770 mark doesn't bode well for the bears in the short-run. 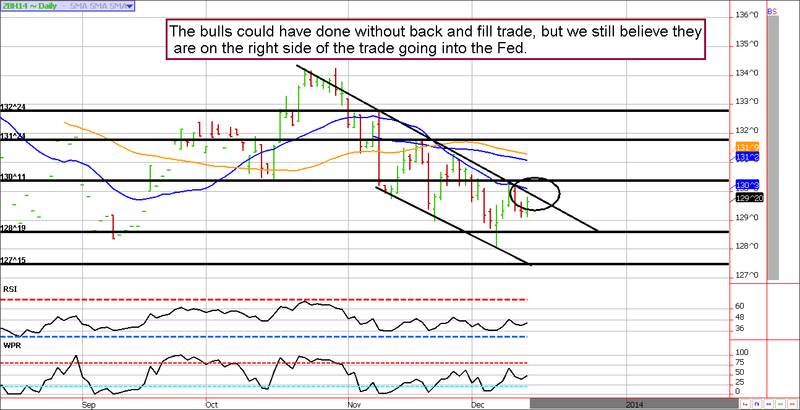 In fact, it signals a probable rise to the upper end of the trading channel. 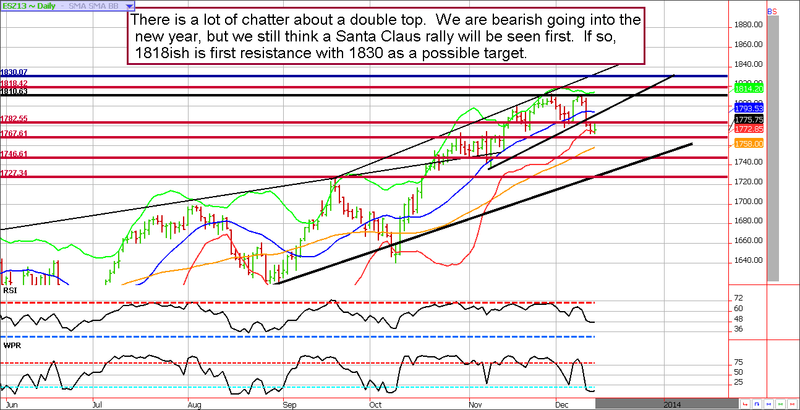 This likely translates in to a retest of the highs, or even a moderately higher probe (think 1830ish). We'll be holding out for these levels before turning comfortably bearish. We know things have been boring lately, but the truth is...less is more in December. Light volume make this a treacherous time of year to be trading, so you are best off keeping things on the light side. - The ES has consistently rallied into Fed meetings in recent years. There are many theories as to why it happens, but it is likely due to the fact that the Fed almost always comes through with QE stimulus talk. Also, the most active traders in the market tend to be short sellers (bulls are more often buy and holders) and the event risk encourages them to get flat, or lighten up, ahead of the Fed (as they buy shorts back they put upward pressure on the market). Maybe this time will be different, but the odds are against it. - More often than not, the ES rallies in the first two or three sessions of option expiration week. In fact, in a quarterly expiration (Quadruple Witch), we often see the ES post an extreme high on the Friday morning the futures contract goes off the board (expires). With this in mind, statistics point toward a new high going into the end of next week. Again, maybe this time will be the odd man out...but all we can do is go off of probabilities. - We've said it before, and we'll say it again. December equity markets tend to see melt up trading into Christmas. Many will have you believe it is Holiday spirit, but we think it is simply the result of a light volume environment in which the most active traders (the shorts) square up positions (and get squeezed out). Once we get past the aforementioned events, we believe the market is highly vulnerable to a much needed correction (or should we say wake up call to the complacent). Until then, the odds are for a grind higher in the short-run. **Consensus:** We wouldn't mind getting bearish from higher levels; ideally 1827ish.